Spreading out its Cyber-shot line of digital cameras, Sony has launched two svelte Cyber-shot W series cameras – DSC-W180 and DSC-W190 – in the Indian market. Sony DSC-W180 is 10.1 mega pixels camera sporting 3x optical zoom lens and 2.7-inch Clear Photo LCD. The camera features 17x smart zoom, maximum magnification for capturing fantastic close-ups and vivid detail. Sony DSC-W190 is 12.1 megapixels camera sporting 3x optical zoom lens and 2.7-inch Clear Photo LCD. The camera features 18x smart zoom, maximum magnification for usuperb close-ups and vivid detail. Additionally, W190 has a 1/2.33-type Super HAD CCD sensor. The 18.7mm slim new Cyber-shot W series cameras – DSC-W180 and DSC-W190 – are capable of capturing still photographs and videos. The cameras feature Face Detection, Smile Shutter and Digital SteadyShot technologies. The cameras are capable of automatically optimizing image settings for capturing excellent quality photos. Face Detection makes cameras capable of detecting up to 8 faces in a scene and automatically adjusting focus, exposure and white balance, and creating optimal capture settings for excellent quality photos. Smile Shutter helps users in capturing smiling faces. Digital SteadyShot helps in reducing the possibilities of poor results due to effects of camera shake by capturing two images in rapid succession and then superimposing the images to eliminate effects of camera shake. The new Cyber-shot W series cameras offer seven scene selection modes – High Sensitivity, Twilight, Twilight Portrait, Landscape, Soft Snap, Snow, and Beach. The high sensitivity mode of up to ISO 3200 helps eliminating blurring while shooting dim light conditions or while capturing fast-moving subjects. The selection modes help optimizing camera settings automatically for different environments for capturing beautiful photographs. The new Cyber-shot W series cameras feature drag-and-drop style for easy transferring of images and videos onto computers through USB. The two new cameras are loaded with Picture Motion Browser ver. 4.2.01 software for easy photo and video management. The new camers come with new and unique feature eDeco that adds mood-enhancing elements photos and videos, including matching photo frames, background music, text and sound effects. The cameras also come with Movie Tracer for constructing panoramic images using a combination of movie frames. 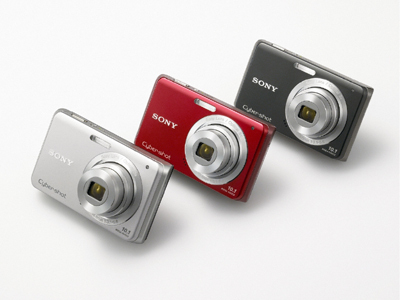 The new Cyber-shot W series cameras – Sony DSC-W180 and Sony DSC-W190 – are available in metallic red, black, and silver colours. Sony DSC-W180 is priced at Rs. 8,990, and Sony DSC-W190 is priced at Rs. 9,990.